Ashura is a deity of war, but also a mighty guardian deity. As a power-seeking war deity, Ashura represents battle and competition, but as a guardian deity he represents ethical devotion and commitment. As both, he fiercely protects that which he is charged with protecting. His purpose is to fight, to compete, to conquer, and to protect what is right. His origins and associations lend a lot to his character. His roots in India lend a very demonic association, a connection with many “malign” passions against the order of the heavens. In Persia (now known as Iran), Asura was associated with light, order, truth, and righteousness, in the form of Ahura Mazda, the supreme deity of the Zoroastrian faith. Perhaps this is how Ashura is able to blend the forces of war and competition with the forces of righteousness. Ashura is a deity of strength, and without strength you can’t protect anything, not even yourself. Ashura reminds me of that. With his “demonic” origins and his associations with a deity of light and order, he also reminds me of why I associate with the forces of darkness and the Left Hand Path in the first place: I don’t do so because it’s dark, or out of mere gain, but because I believe in path a based on honorable principles, something worth ultimately fighting for and defending. The Asuras before him fought the Devas in the heavens, and did not win through guile and trickery but through sheer force of will, and so Ashura is also the deity that overcomes with force of will. It may not be something that can always be done in this world, but I still admire it (really it’s impossible not to admire), and I still have a desire to believe in it. It’s important to remember that though he is a protector deity associated with honor, his mine theme is aggression, combat, and sheer force of will overcoming an obstacle or enemy, and his guardian deity persona may be an extension of his theme of violence and wrath. His relation to Ahura Mazda also relates him to Varuna, who was the deity behind Ahura Mazda, and in a sense that might make them cousins or something. Now that I think about it, he may also remind me of the Vedic deity Mitra, since for them matters are more clear-cut and require less contemplation than Varuna or Shiva. Since Ashura and Varuna both relate to Ahura Mazda, it is an interesting idea that they both represent Ahura Mazda, and that Ashura may fulfill a role not dissimilar to Mitra, though not necessarily as Varuna’s brother. Although Ahura Mazda was one of the original monotheistic figurehead deities, something about him interests me. The history of Ashura begins with the Vedic religion of India. In the earliest period of the Vedic religion, Asura was an adjective meaning “mighty” and “powerful”. Many deities were given this adjective and variants such as “asurya” (meaning strength) and “asuratva” (meaning mightiness), some deities more so than others. Indra, the weather deity, was described as “asura” nine times, as granting or possessing asurya five times, and as possessing asuratva once. At one time, Indra’s actions are described as “asuryani” (meaning powerful), which add up to sixteen descriptions in total. Agni, the fire deity, is described as asura twelve times, as son of an asura once, and as possessing asurya twice, which also totals fifteen descriptions. Varuna, the deity of the waters and cosmic order, is described as asura ten times, and as possessing asurya four times, which totals fourteen descriptions. 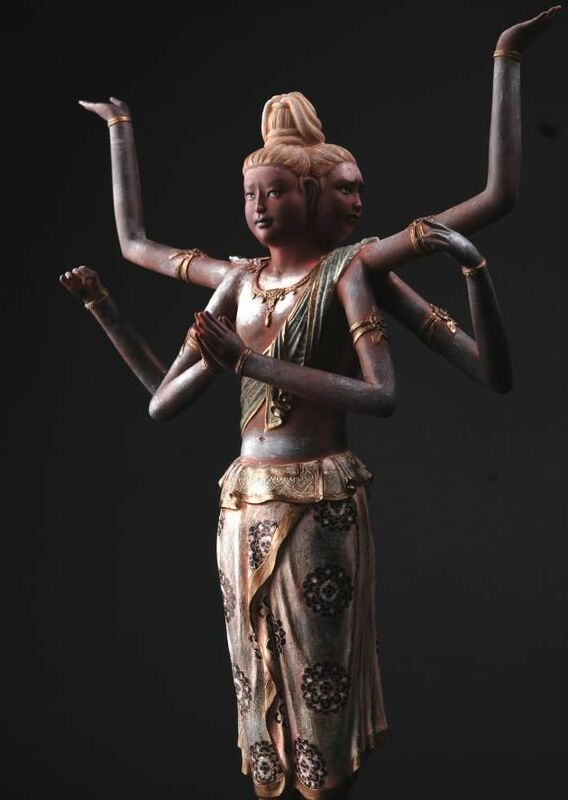 Mitra, the deity of friendship and contracts, is described as asura four times, and as possessing asurya four times, totaling eight descriptions. Rudra, the feared storm deity, is described as asura six times, as bestowing asurya once, and possessing asurya once. Dyaus, the sky deity, is described as asura six times. Soma, the lunar deity, is described as asura three times, as bestowing asurya once, and as possessing asurya once. Savitr, a deity of the sun before sunrise, is described as asura four times, and is particularly described as a kind leader. Surya, the solar deity, is described as asura three times. Parjanya, a rain deity, receives the same amount of honors as Surya. Vayu, the wind deity, is described as asura once, and once as possessing asurya. Apam Napat, a creation deity, is described once as possessing asurya. Sarasvati, a river goddess, was described as asura once. Ushas, the dawn goddess, is described once as possessing asuratva. The more times a deity was described as asura, or as possessing or bestowing asurya or asuratva, the mightier and more powerful a deity was believed to be. Indra, for instance, was likely the most powerful deity of the Vedic religion. And it wasn’t just deities that got called asura, as sometimes humans were called asura in the Rig Veda. Two generous kings are described as asura, as are some priests, and there is a hymn for requesting a son who is asura. Towards the end of the Vedic period, the meaning of Asura started to change. Eventually, it was believed that asura was a separate class of deity or demigod that rivaled and conflicted with the class of deities known as the devas, and that this new class of beings was demonic. These asuras are sometimes compared to the Titans from Greek mythology, who were semi-divine beings of primordial nature that opposed the deities that came to rule Olympus. In late verses of the Rig Veda, the deities are now prayed to in order to ensure the defeat of the asuras, and deities begin to establish their divinity on the basis of them killing asuras. However, the asuras are also described as pious, often moreso than many devas, and are willing to perform ritual austerities and penances in exchange for various boons and powers from powerful deities. It is not known what precisely caused this change. Meanwhile in Iran, the term asura became “ahura”, which referred to a class of angelic beings described in hymns of the prophet Zoroaster. Iran embraced Zoroaster’s new religion, now referred to as Zoroastrianism, which preached a new deity named Ahura Mazda to be worshiped exclusively. His name derives from the term Asura Medhira (which meant “mighty and wise”). His opponents were the daevas, based on the Indian devas, led by an “evil” being named Angra Mainyu. The Iranians started viewing the deities of India as false deities, and for them Asura meant the forces of light and truth. I feel I should mention that the term Asura Medhira refers to the Vedic deity Varuna, who was one of the mightiest Vedic deities, and was even considered “Father Asura” in the Rig Veda and was given the title of “medhira”, meaning wise. As I already mentioned, in Vedic India, Varuna was the deity of the waters and the cosmic order in India. However, back in the Vedic period, Varuna was considered one of the top deities (certainly one of the mightiest), if not the top deity, who ruled the heavens and the gods. He was the leader of a group of solar deities known as the Adityas, and he was seen as the supreme lord of law and order and the protector of the order of the cosmos. He was also a deity who would grant wisdom (or “medhira”) to his devotees, and in particular this wisdom constituted insight into the natural order (also known as Rta), and ruled over the primeval chaos alongside his twin brother Mitra. However, he was eventually ousted as the chief of the gods, and his spot was taken by Indra, and eventually he faded into obscurity following the rise of Trimurti (Brahma, Vishnu, and Shiva) and the texts that exalted them. In Iran, it seems that Varuna wound up becoming Ahura Mazda, the lord of cosmic order and justice and the supreme deity of Zoroastrianism. I must wonder if there were people in those days who favored Varuna and didn’t like Indra being the supreme deity (funny enough, the Zoroastrians considered Indra a demon). In Buddhism, the Asuras were similar to their post-Vedic Hindu incarnations in that they were demigods who constantly fought another group of deities. The asuras are described as warlike demigods who are addicted to many passions such as anger, envy, and pride, and are more powerful than humans but less powerful than devas. In the Buddhist view of reincarnation, humans who are obsessed with violence, force, battle, and passions such as pride would reincarnate as Asuras after death. The existence of the Asuras is filled with strife and conflict, as well as envy for the devas, without any peaceful inclinations. In Japanese Buddhism, however, the Asuras are also considered guardians of the Buddhist faith, part of the Hachi Bushu (“Eight Legions”). The Hachi Bushu are believed to be eight groups of supernatural beings that originated in Hindu mythology but converted to Buddhism after listening to the words of Siddhartha Gautama (known in Japan as Shaka Nyorai), and have since become guardians of the dharma (or Buddhist law). Eventually, Ashura (aka Ashura-ou), the king of the Asuras, became seen as a single guardian deity, and his famous statue at Kofuku-ji is well-recognized. Ashura may have arrived to Japan from China and Korea, like many Indian deities. On an interesting side-note: it is sometimes believed that the Asuras do not drink alcohol. This is probably based on a story where the Asuras used to live in the Trayatrimsha heaven, but were expelled by Sakra (Indra) because they were fond of drinking and eventually were caught drinking a forbidden liquor called Gandapana, and after their expulsion they supposedly vowed never to drink again.